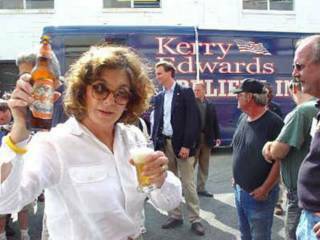 Some opponents want Teresa Heinz Kerry to appear as "Queen of Beers"
This photo has been forwarded around the internet as a character slam on Teresa Heinz Kerry. A friend sent it to me with the caption, "Kids, this is no first lady." I would rather say something else to our children, similar to what my wife, Jill, told my daughter one day when she came in the dining room of some friends who had served us wine: "Ashley, we are drinking wine. It's OK. It is not wrong. Jesus and the disciples drank wine. The Bible does not say not to drink. What God does not want is people to mis-use alcohol and get drunk." Had the Pharisees snapped a photo of Jesus at a wedding feast or sitting with lousy fishermen, prostitutes, and Jewish renegades, no one would have elected him. They would have crucified him, which figuratively is what opponents of Kerry want to do with his and his wife's character.